High elevation scenery and historic mine buildings. Gorgeous high-elevation scenery and incredible wildflowers. Trail accesses historic mines including the massive Virginius Mine and the Mountain Top Mine. Mines are on private land, so you are not allowed to drive all the way to them. View from a distance and stay out of buildings. Popular trail for Jeep tours. Side trip to Sidney Basin is worth the trip. Roads open to all vehicles May 16 to Nov. 30. Shelf road is narrow in spots, but the main trail is wide and flat. Sidney Basin has one steep choppy hill and large embedded rock near end. 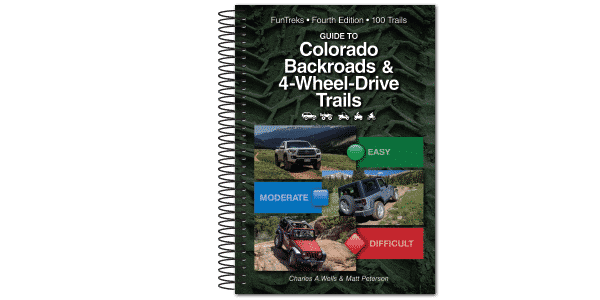 Due to our findings driving this trail in the summer of 2018, we have changed the rating of this trail to Easy in our 4th edition book from Difficult in our 3rd edition. We drove Governor Basin on 09/20/18. Other than the shelf road being narrow in a few areas, the trail was easier than Yankee Boy Basin, which we did the same day, and Imogene Pass. At this time, I would rate this trail as difficult possibly easy.